Does your chest ever feel tight? Do you find it hard to catch your breath at times? These could be signs you have asthma. Bronchi are the small tubes that carry air in and out of the lungs. These become inflamed when suffering from an asthma attack, making it harder to breath. Asthma is more common in children though the condition sometimes clears up naturally as they reach their teens. Although asthma attacks often seem like they just happen out of the blue, it's thought that external triggers contribute considerably as to when they occur. The symptoms of asthma can rapidly worsen; this is known as an attack or 'exacerbation.' Severe attacks may require hospital treatment and can be life threatening, although this is uncommon. Magnesium is an essential mineral that helps to regulate a range of diverse biochemical reactions within the body. An adult human contains around 25g of Magnesium, around 1% of which is found in the blood supply. Transdermal magnesium is easily absorbed through the skin and can be especially beneficial to people suffering from asthma attacks as when applied to the chest and back it has the ability to relax the muscles and tubes surrounding the lungs making it easier to breath. In severe cases of asthma, intravenous application of Magnesium can help to ease the muscles and regain control of breath. First, we are going to need some transdermal magnesium chloride. This simple form of magnesium can be dissolved in distilled water. The second step is to add your transdermal solution to a spray bottle for easy application. At the first signs of an attack spray the Magnesium on both your chest and back. 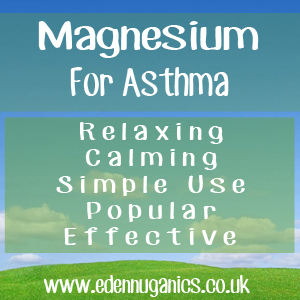 Allow the Magnesium to be absorbed through the skin, this will offer instant relief and help to loosen the airways. "The problem is magnesium absorption, as well as magnesium deficiency in our diets. The soil in every country in the world except Egypt has been farmed to a point of magnesium depletion. Furthermore, magnesium salts are laxatives so that all of them may lead to a more rapid gut transit time. Magnesium needs to travel through the intestinal system slowly, so if the gut transit time is less than twelve hours, one is not likely to absorb the magnesium well." - Dr. Norman Shealy, M.D. Ph.D.